Nathan Mackenzie is a father, hobbyist, passionate full-stack developer, and Battlesnake enthusiast. This is part two of his two-part guest post about his experiences as a Battlesnake participant (part one is available here). For this second part, I will discuss each of the steps above and how I accomplished them. Note: There are many ways to implement this, and I decided to recycle some code from Noah Spriggs snake and my original snake. The pixelated snake source code is here if you want to follow along. The easiest way I found to do this is to collect all possible moves that Pixelated could move to, ie: up, down, left, right. With this method in place, I could choose any one of these coordinates to move and they would be safe. The above methods allowed Pixelated to stay on the game board and not run into his own body. If you have questions, head to the Battlesnake slack community. Now that we could wander around the board (until we starved) Pixelated needed to find food and go eat it. 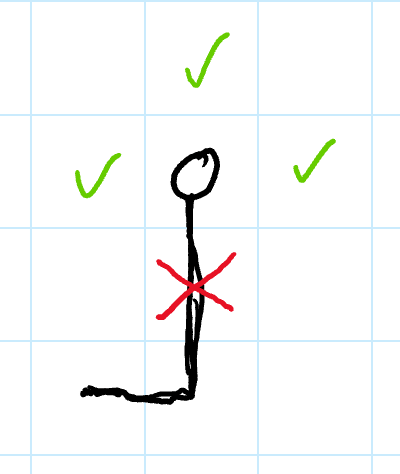 A simple way to accomplish this is with a pathfinding algorithm like “A*”. An excellent resource for learning this algorithm is from Stanford University Theory papers, specifically Amits A* pages. I won't go into detail about how the A* algorithm works, I’ll leave the pathfinding research to you. I used A* because it returned the shortest path to food and I wanted Pixelated to get food quickly. We have logic to avoid going off the board and avoiding ourself. We use A* to find food on the board. The first defensive move in Battlesnake usually is the classic tail chase. When in doubt find your tail! To accomplish this we use A* again and set the goal as our tail instead of food and presto, defensive maneuver complete. Well, complete to a certain degree. In my case, I use it if there is no path to the food or my length is above a threshold. Previous steps assume you are on the board by yourself cruising along and eating food — this is the bread and butter of Battlesnake. However you cannot just aimlessly slither around the board because there are enemy snakes also on the board. There are many different ways to deal with this, and one is to add a third parameter to your neighbour call and filter out coordinates in enemy snakes as well. This is the method I chose and it follows along with my map representation which I’ll cover next. # everything remains the same as before with the exception of    the last check. In just about every pathfinding paper they discuss map representation. Take a look at this grids / graphs write up its amazing! I liked all the examples I read, so I decided to use a grid to represent the game board. Excellent, we have a grid! Next, we need to decide how we will represent things on the board. I stuck to integers because of some calculations that I do however you can use whatever you like. With these values we can iterate over each enemy snake and mark the cells that match their bodies. Things are now starting to come together by creating the grid we have basically given our snake a brain that we can use to guide it. Our basic survival instinct is now in place and we can start to focus on more defensive and aggressive logic. Checking more moves ahead for enemy snakes (this was the reason for missing out on first place for 2019). The way my map is setup Pixelated prioritizes kills without looking ahead to make sure its safe which lead to Pixelated’s demise in the final head to head. I have gone through multiple iterations of the grid, and in some I had too much information and others I had too little. Finding the right balance for your board representation will have dramatic effects on your snake's actions (I still need to improve this). One example of this is how you are representing safe/unsafe areas. 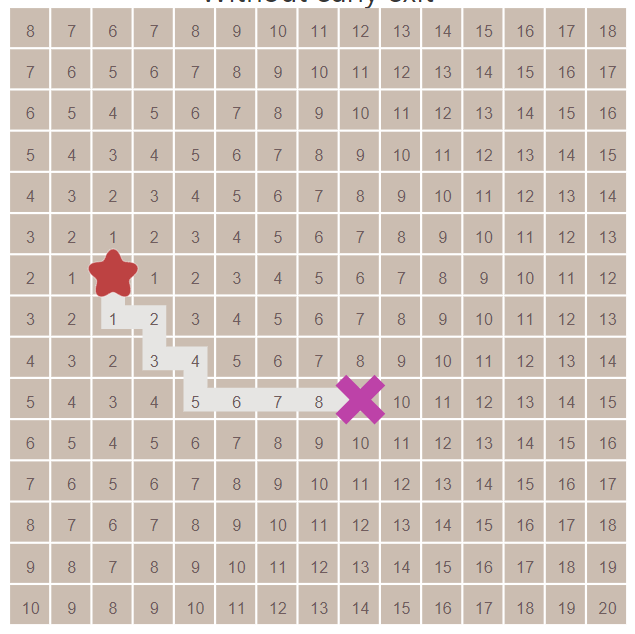 Pixelated A* has only been enhanced with a tiebreaker so that it will explore less of the grid for finding a path. Finding the right decision in the tiebreaker case is a tough call because in some situations it will enhance pathfinding and others it won't. A* isn't the only pathfinding algorithm, there are many to choose from. Each pathfinding algorithm also has a subset of optimizations as well. There are so many more edge cases to worry about once you start playing against other snakes, don’t be fooled. Sometimes a fix I implemented broke other logic and produced undesirable results. You won't get them all. Try to deal with the most re-occurring edge cases and not the one-off ones. I suffer from chronic pain, PTSD, and partial short term memory loss. Dealing with these on a daily basis is hard enough, Throwing a competition in the mix elevates the difficulty. Regardless, it may have taken me three years of attending to finally feel like I am ready to move up to the next bracket but I made it and I will be ready for Battlesnake 2020. This is a list of the biggest hurdles I had, there are plenty more minor ones to work on but I felt for informational purposes these would be the ones to focus on.